A different kingdom of wolves, woods and stranger, darker, creatures lies in wait for Michael Fay in the woods at the bottom of his family's farm. Paul Kearney is a new author for me, and all I can wonder is how I ever missed him! 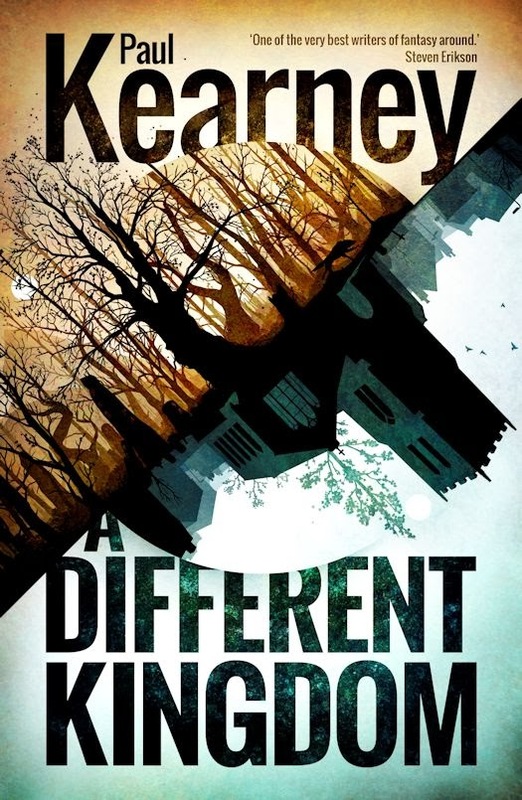 His A Different Kingdom starts off in rural Ireland sometime in the 1950s, after the Second World War, and while Ireland is deeply divided along religious lines between the Catholics and the Protestants. Much of Ireland is still farmland or unsettled wilderness. Modern luxuries such as mechanized farm equipment and motorcars are few and far between. It was a time of transition, and as such, a terrific environment to set his coming-of-age story for Michael Fay. Michael Fay is an orphan whose parents were killed as collateral damage in a bombing in Belfast. At the start of the book, he is about six years old. The opening chapter focuses on his extended family -- the grandparents who run the farm, his uncle who is eager to take over running the farm, two aunts, various cousins, and any number of field hands who work the land around the homestead. However, in the middle of the first section, Kearney introduces an older Michael with his lover, Cat, fleeing for their lives in a world distinctly different from the placid farmlands where he played as a child. Then the story cuts back to the young boy who discovers that past the river that separates the fields from the forest is an Other Place, more wild and mysterious than his everyday life. From there, the story jaunts to an even older Michael, living alone in a city as a bartender and trying to forget the magic that once surrounded him. Kearney continues to intertwine the three narratives back and forth, rather than tell his tale simply from start to finish. While it seemed a little startling at first, I came to enjoy wandering around with Michael at various ages and trying to put together the pieces of his life in some straight line. It was almost impossible to do, which may seem unsettling, but actually worked the way that Kearney presented it. Juggling timelines and locations just added to the overall mystery of the story. Kearney has a terrific eye for detail, and his descriptions are extremely well done, painting vivid pictures of his characters and their environments. The Other Place has several different races that may have evolved from different time periods of our world – seemingly wild men who could have evolved from Neanderthals, fae creatures that might be the original Fairy folk, missionaries/Templers who dictate their religion to the folk scratching out a living in return for protection, and the werewolves working for the Dark Huntsman who may well be the Devil himself. This story is almost dreamlike in its telling. The language is lyrical, and the action is raw. I definitely enjoyed A Different Kingdom, although it was not an easy novel to read. It requires a reader to take it in great chunks. For someone like me who bounces between two or three books at a time, I had to focus all my attention on this one, but it was well worth the investment.